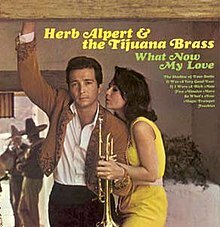 What Now My Love is the sixth album by Herb Alpert & the Tijuana Brass, released in 1966. It remained at #1 on the Billboard Album chart for nine weeks, the longest of any album released by the group. By this album, the Brass were playing only a token Mexican-themed song or two per album, the rest of the tracks being pop hits and Broadway tunes. Two songs from the album found use as American TV show themes: "Brasilia" was used as the theme for the game show The Face Is Familiar, and "So What's New?" for Lloyd Thaxton's syndicated rock music program. This was the fourth consecutive (and final) of the TJB albums to feature an attractive woman on the cover, a typical 1960s easy-listening hook. The "model" is Sandra Moss, wife of Herb's A&M Records partner Jerry Moss. A clip from Thaxton's TV show featuring "So What's New?" This page was last edited on 23 December 2018, at 17:46 (UTC).